"One bite at a time!" It is silly but holds so much good advice for every part of life. This week I've committed to not only watering our plants first thing in the morning, but also doing some weeding. It doesn't have to be tons, but some. This morning, though I wasn't that motivated to do it, I started watering and had almost talked myself out of weeding when guilt took over. By the time I had taken my body to its limit, something amazing happened. I felt so much better. My backyard needs a lot of work and has shouldered a lot of neglect this year, but it didn't feel doomed. And the thought that I would come back in a day or two and do a little bit more just energized me. Emotions, just like Oklahoma weather, are bound to change if you give it a little time. My habit is to tackle (or maybe endure) something full force and then when I stop, put it completely out of my mind until it becomes a fire again that forces itself onto me. That approach is mere survival and is more like a spasm than anything and only reoccurs, usually worse. What I'm thinking today is that my emotional control is no different than weeds. If I monitor my emotions regularly - not just when things seem out of control - I will find handling an out of control situation a lot easier. I guess anything unhealthy or sinful is managed a lot easier when monitored regularly rather than only thought about in the heat of a tempting moment. 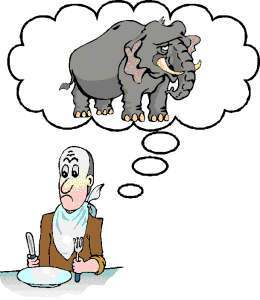 Little things and big things seem to morph into elephant size over night, in our heads at least. Overwhelming tasks can quickly cause you to quit altogether because it all just seems too much to handle. If we (I) would only recognize that the only way things get better is one step or bite at a time, real growth and improvement would be inevitable.